John Hoffmeister (center) is presented his 30-year service award by director of pricing Mike Sanders (left), and Averitt president and chief operating officer Wayne Spain (right). 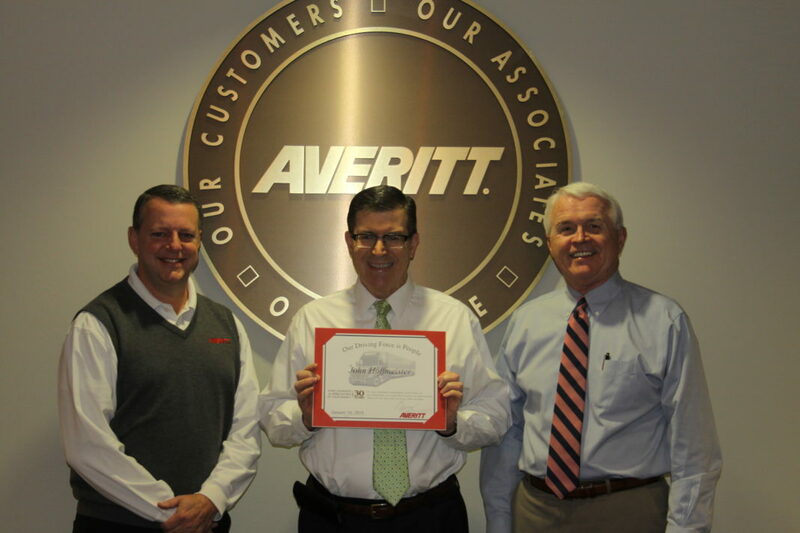 COOKEVILLE – Averitt Express recently honored two associates for their long-time service to the company. Associate John Hoffmeister of Cookeville and Associate Darrell Bohannon of Cookeville were both honored for 30 years of service. Hoffmeister and Bohannon join the more than 1,000 active Averitt associates who are members of the company’s “Over 20 Team,” an exclusive group of associates who have served 20 or more years with Averitt. Darrell Bohannon (center) is presented his 30-year service award by Cookeville service center director Pete Ziegler (left), and Averitt president and chief operating officer Wayne Spain (right).